After spending a solid 3 days in San Francisco, we headed north on the 101 to Santa Rosa, CA, home of one of the most infamous breweries in the US, Russian River Brewing Company. The funny part about this place is that its located in what seems like a strip mall. Unfortunately, this was to be a quick stop as it was already getting late and we still had a long drive ahead of us up the PCH. Its really overwhelming to finally arrive at a place you've wanted to go to for years and to only have about 45-60 minutes to take it all in. Just looking at the tap board had me quivering. We got a plate of their Beer Bites to go along with the delicious sour, barrel-aged brews and I was in heaven. I believe I had the Perdition, Biere De Sonoma aged in wine barrels and Salvation, the strong dark ale. The only downside to the visit was the slightly lackluster service. I guess we were there right at happy hour so it was quite busy. But its set up so you don't have a specific server, so there was a bit of confusion and double-ordering going on. But the beer more than made up for that minor faux pas. As we were finishing up and realizing that our parking meter was about to run out, I ran around to inspect the other side of the brewpub and I was surprised to see just how many fermenters were crammed into the small space. I figure they must bottle off-site and perhaps even have a full production brewery somewhere? Of that I'm not sure. And then there was: THE BARRELS! I had a really hard time resisting the urge to break into this room and sniff all of the barrels and the delicious goodness within. I also walked away with a few take-home bottles of Supplication and Consecration that eventually got shipped back home. If you're heading out west, its only about an hour drive up to Santa Rosa from SF. It was a little bit of a weird feeling driving right by wine country and only stopping at a brewery BUT Russian River is SO good that it makes missing all of the vino just fine by me. 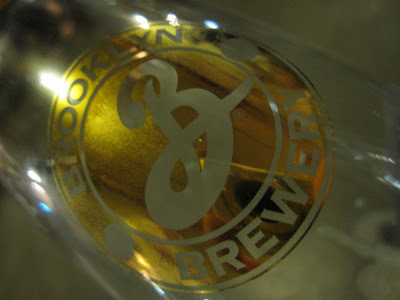 The other night I was able to go to the Brooklyn Brewery release party for the brand new Brooklyn Sorachi Ace and Buzz Bomb Ale Check out my reviews over at SimplyBeer.com! Blog networking FTW! Before we left San Francisco I made it a point to get in a visit at Anchor Brewing Company. If all of the microbreweries in the United States were a family, Anchor would be considered the grandfather. In fact, the (now former) owner of Anchor, Fritz Maytag might just be the first real champion of craft beer in America. Anyways, I booked my tour several weeks in advance of the trip as various sites online stated that they filled up early. The tour lasted about an hour, as its still a pretty small operation despite its wide distribution and success. My tour group got to see the all-copper brewing operation, the cold cellar and the bottling line area. Wish I could have one of these at home. I don't think I've ever seen a copper brew kettle like this up close. It really makes you think of the Sam Adams Utopias bottle. Tour guide giving us the 411. The most interesting factoid we learned was that during the 1989 earthquake in SF, Anchor had their famous Steam Beer brewing in the tanks. The power at the brewery went out and the beer sat in the kettle for awhlie before power could be restored. They continued the brew and found that it came just slightly different than their usual Steam Beer. They decided to commemorate the beer by bottling the entire run with the label upside-down. Above the tasting bar you will see quite a few bottles. What you're looking at is a bottle of every single Christmas Ale Anchor has brewed since they started brewing it in 1975. That's one helluva vertical. We got to sample 5 of Anchor's offerings: their flagship Steam Beer, Porter, Old Foghorn Barleywine, Liberty Ale and the newly-bottled Humming Ale. Anyone visiting San Francisco should really make a point to go to Anchor. It feels like the mecca of microbrews that every beer geek should worship at. Just keep in mind its nearly required to book your tour early. As I mentioned above, Anchor was recently sold to a group thats known for marketing Sky Vodka. While its been said this group has plans to expand the brewery, they've also stated they'll keep the roots of what makes Anchor a great brewery. My opinion? If they can keep it great and experiment more on top of that? I'm all for it. Back in early April, the girlfriend and I took a trip out west to road trip up the Pacific Coast from San Francisco all the way to Seattle. Of course, while we were planning the trip I tried to sneak in as many brewery/brewpub visits as possible. Consider this the prologue to the more in-depth bloggings about the trip. The first day we arrived in San Fran was a bit of a whirlwind with trying to cram in as many touristy things as possible (none of which were beer-related). It only occurred to us at the end of the day that it would be nice to get some beer to bring up to the hotel room to sip on before hitting the hay. I quickly whipped out my trusty iPhone and used the Find Craft Beer app to find a place right around the corner from our hotel with a decent selection. We came away with a 6 pack of New Belgium Ranger IPA. This is probably not all that interesting to readers west of Pennsylvania, but for this NY/NJ beer blogger, New Belgium beers are hard to come by. The beer itself was good, not great. It seemed to have a much hoppier aroma whereas the taste provided only a slightly bitter, more citrusness to it. Yet it was still a great way to end a long day of seeing San Francisco's best. Back in January I purchased what was then the world's strongest beer, Brewdog Tactical Nuclear Penguin. The question I was left with when it arrived was when in the hell to open a ~$60 12oz beer. Some time passed and TNP fell to the world's third strongest beer. Fast forward to April when the girlfriend and I had a housewarming for our new apartment in Jersey City. I figured this was as good as an occasion as any to pop this 32 percenter. I ended up splitting it with my two homebrewing buddies Jeff and Tim. This was definitely a good idea because surprise surprise, this baby packs a punch. As you can see there was little to no head when we poured it, but it did have a nice dark brownish-red appearance to it. The aroma hits you hard with a scotch whiskey smokiness that is pretty inviting. The most interesting thing about this beer (if you can really even call it that) is that its surprisingly drinkable. For its off-the-wall ABV, its really a good sipper. Is it worth the exorbitant price tag? For a one time thing, I'd say yes. Would I spend that much on it again? Probably not, but mainly because you can get a great amount of other craft beer in a much larger quantity for the cost.